Here are our Havanese Boys. These are the Daddy's to our puppies. They are at this time all AKC CHampion show dogs. Some even Grand Champions. Once they are fully health tested then they would be avialable to public stud to service purbred health tested girls. Some of these boys live in "guardian homes" and are not always here to show them to you. But can usually be made available when needed. Handsome is just that. He is super cute, looks just like his mother. We chose not to put a grand champion on him as he doesn't like to show. He finished very fast anyways cause he is really irresistible. He is a smaller dog at 8.5 pounds. He passed all his health testing without any problems. He carries both chocolate and red colors. So we are excited to see what his future brings us. "Chase" is an amazing boy. He has amazing movement, super sound front and rear. Amazing coat and with great markings. He is only 8 months in photo. He is sooooo sweet, laid back, easygoing, and gentle boy. He hit the ring and took to it like a natureal and won both majors first time out. Finished his championship very fast and easy. Now completed his Grand too. He is now been health tested too. He is a grandson of our beautiful GCH Awesome and CH. Charlie. ​He carries dark chocolate gene. Charlie is a sweet little solid boy. He finished his championship from the BBE class. He is super cute face, dark chocolate color, dark pigment, and is just irresistibly cute. He has great springy movement and attitude. His tail never stops and he gives great big smiles. He is producing stunning pups, nice coats, and super dark chocolates that hold color! Producing lots of champions. "Adonai" (Ad-o-nai) is Hebrew for Lord. He is such is a stunning red brindle boy. His color is really pretty and so is his coat and movement. He entered the ring one weekend and won 4 majors to gain his entire championship in one weekend. Everyone loved and adored him. He is now fully health tested and producing stunning puppies. 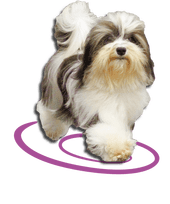 He is one of the sweetest havanese ever, loves everyone and is a total charmer. He is just the sweetest and most loving little guy you could every ask for with a true havanese personality. He has now earned his Grand Championship title too! Watch for his outstanding kids in the ring soon. He produces chocolate, red, tris, brindles, and more. First kids now akc Champions. Watch for more of his kids in the ring now too, including his son Bordeaux. GCH CH Honor Love Your Enemies. Matthew is our amazing boy. We are so proud of what all he accomplished in a limited show career. He championed very fast, then onto his grand getting group placements along the way. His movement is just outstanding and stunning. Beautiful springy sound movement. He's already produced couple of champions with many more coming out now. He's proving his quality as an amazing stud dog too. His mom is my outstanding CH. Bonita, and his dad is G CH Sunny, who produced tons champions for us in his short visit here to be shown. He is available to approved girls for breeding. Fully health tested clear now. Produces tons of colors and likes his markings. ​CH. Honor Walk on Water. Peter loved to show and finished in only 3 weekends. He moves beautiful and is a nice average size and happy go lucky personality. Peter is our outcross boy to bring in some new bloodlines. CH Honor Left Behind. "Rapture"
Rapture is as stunning as he looks. He is AKC CHAMPION. 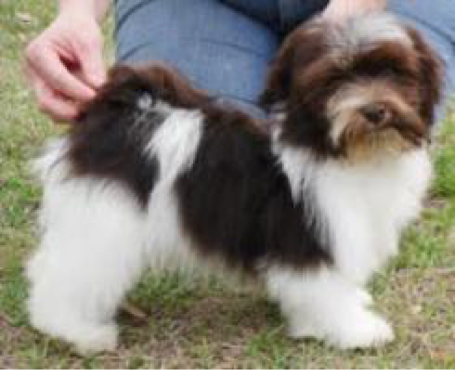 He is producing very cute puppies in blacks chocolates, and tris with his cute face and markings. 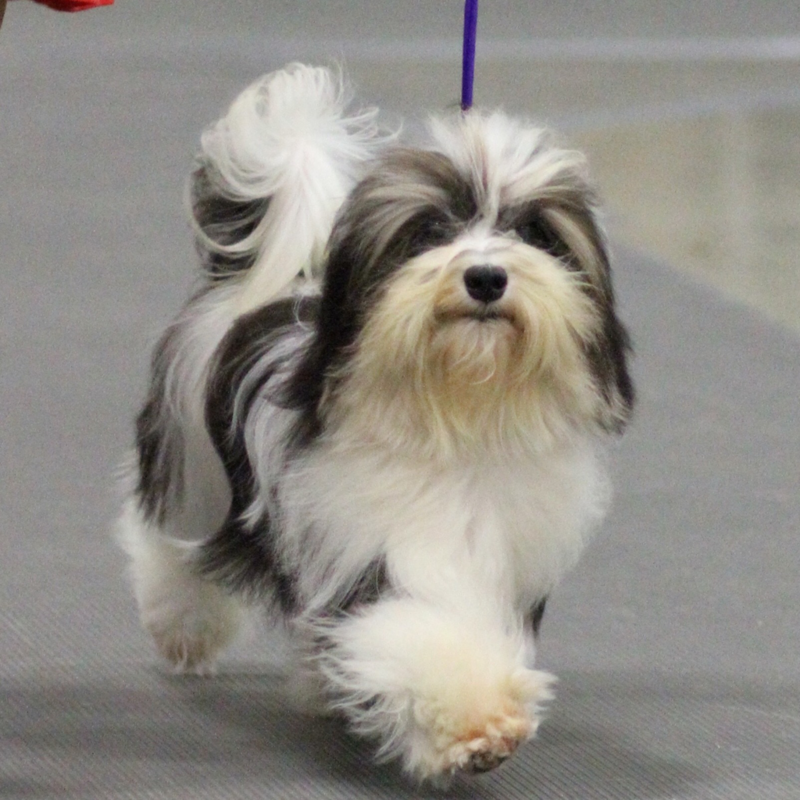 update: Rapture wins reserve at Havanese Regional speciality! what an amazing win for such a young puppy. Seems the judges like him as much as we do! ​His first kids are staring to hit the ring and they are as cute as him! His mom is our beautiful Chocolate girl TWIX. His dad is GCH. Honor NW Rain and Sunsine. Rapture is now in his new home in canada. "Kneel" His is almost perfect strucutre, showy, tri color with cute eyebrows. He has perfect strait legs, great topline, movement, and beautiful head. He is sweet, gentle, loving, loyal, and all around a great top quality dog. He achieved his Championship in only 3 weekends, and then his grand in only 2 more weekends with several breed wins, still as a puppy. He could easily become a top dog in the country. He has been fully prelim tested normal and clear on everything. He is perfectly healthy. His first litter is looking very promising. Due to him too related to our other dogs, he is now living with another breeder further north. ​CH. Honor Seek and Ye Shall Find. Seeker is a small, but stunning little chocolate tri. He loved to show and owned the ring. Finishing his championship with 5 major wins. He has the most amazing silky wonderful coat with beautiful chocolate color. His daddy is the amazing Matthew. 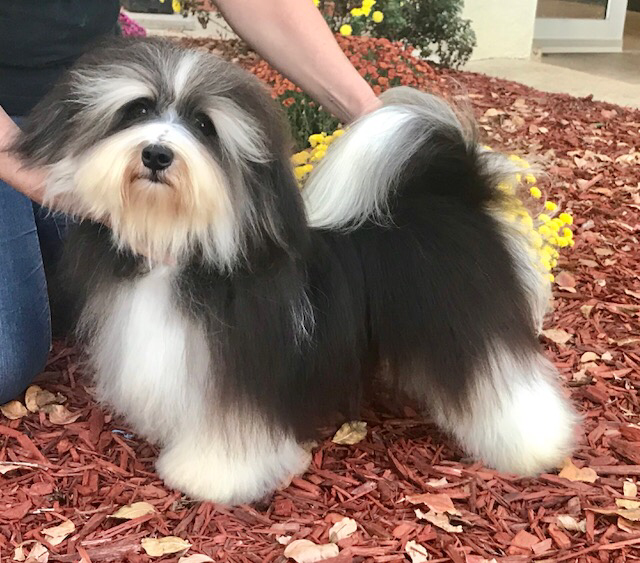 "Bordeaux" is our next amazing boy here at Honor Havanese. He is out of our Keeper and Adonai. He is a stunning red irish pied. He has only been shown one time and has a 4 pt major! Not bad for the day he turned 6 months old. 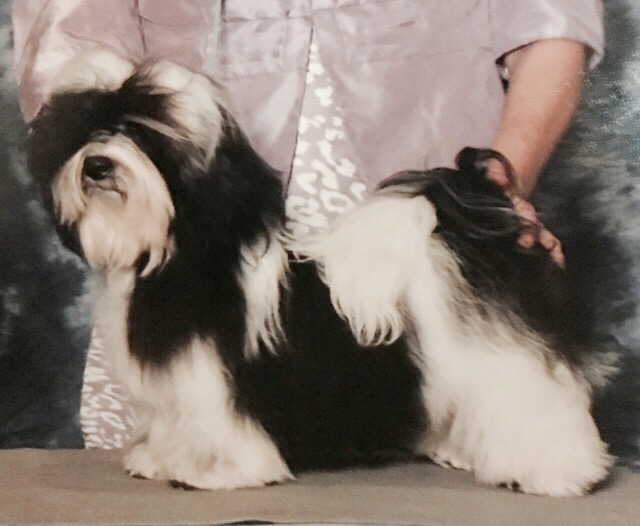 UPDATE: He wins several times at the Royal Canin shows and big major at AKC classic going BOW. Then on to TX for a big won going breed over top champions to complete his championship with a 5 pt major! He completed his grand in only few shows. Our boys are available at public stud to approved purbred registered girls that have been health tested.